An examination of our culture’s addiction to systematic violence and environmental exploitation, and the heroism of those who confront it head-on. The causes underlying the collapse of civilizations are usually traced to overuse of resources. As we write this, the world is reeling from economic chaos, peak oil, climate change, environmental degradation, and political turmoil. Every day, the headlines re-hash stories of scandal and betrayal of the public trust. We don’t have to make outraged demands for the end of the current global system — it seems to be coming apart already. Backed by Jensen’s narrative, the film calls on us to act as if we truly love this land. The film trips along at a brisk pace, using music, archival footage, motion graphics, animation, slapstick and satire to deconstruct the global economic system, even as it implodes around us. 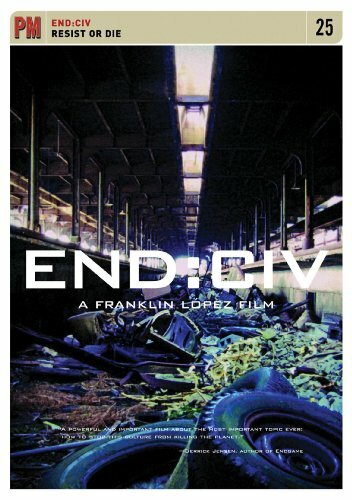 END:CIV illustrates first-person stories of sacrifice and heroism with intense, emotionally-charged images that match Jensen’s poetic and intuitive approach. Scenes shot in the back country provide interludes of breathtaking natural beauty alongside clearcut evidence of horrific but commonplace destruction. END:CIV features interviews with Paul Watson, Waziyatawin, Gord Hill, Michael Becker, Peter Gelderloos, Lierre Keith, James Howard Kunstler, Stephanie McMillan, Qwatsinas, Rod Coronado, John Zerzan and more.